Grano nursing chair from Monte Design - it glides & reclines! Grano nursing chair from Monte Design – it glides & reclines! Now that I’m a fully-fledged mother-of-three, I’m checking off a big list of things I know now that I wish I’d known when I was preparing for my first baby. Things like how unnecessary those fancy nappy disposal units really are. And how incredibly useful a nursery rocker would have been from the very moment I started on this crazy, beautiful journey they call motherhood. 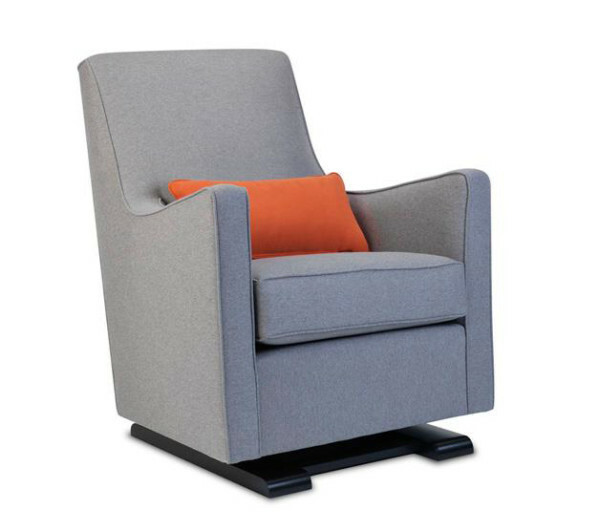 I’d always pegged the idea of a nursing rocker as a bit of a non-essential luxury… lovely to look at, sure, but who needs one really… until I got the Monte Design Grano glider recliner with baby number three. (That’s my little bundle of loveliness, Audrey, up top there in her Grano chair). Now, of course, I’m wishing I’d had one to use right from the start for all my girls. It’s a rare newborn that doesn’t have some unsettled times, whether during the day or the dead of the night. I still remember pacing the hall with my first babies, doing that desperate little jig shuffle you do when there’s an unsettled infant in your arms. I remember too how awkward it was as a first-time mum trying to find a comfortable, workable position on the couch while fearing I was never going to get the hang of breastfeeding. Third time round, I know a few baby settling tricks. And breastfeeding’s no longer a daunting mystery. A lot of that’s got to do with experience. But, hand on my heart, I wouldn’t do half as well without my Grano chair. Good looks and sturdy build aside, it has a gentle gliding and rocking action that works well to settle my Audrey, so there’s been no zombie shuffling along the hallway at 3am for me this time round! I can’t tell you how many times it’s rocked us both to sleep, or how many catnaps I’ve snatched while feeding her easily and comfortably in this chair. It’s designed to be the perfect place for feeding, whether you prefer an upright position or a slight recline. Importantly, the low arms of the Grano don‘t get in the way to hamper breastfeeding as your baby grows, as can happen with an ordinary armchair or rocker. Oh, the fabric is water-repellant and stain resistant too. Which, first-time mums will soon learn, becomes terribly important the first time your baby detaches from the breast mid-feed! It goes without saying that cuddles and story-time are a shoo-in with this chair. Not just for Audrey, but for all my girls – and sometimes, though it is a tight squeeze, all of us together! This is one chair that will be finding a home at our place long after my last baby is weaned and my kids grown. The Grano glider recliner and other Monte Design nursing chairs are exclusive in Australia to Mantha & You. The Grano comes in three colours (I have heather grey, pictured below) and costs $1999. Matching back support cushions in designer fabrics from Missoni and Paul Smith are also available.